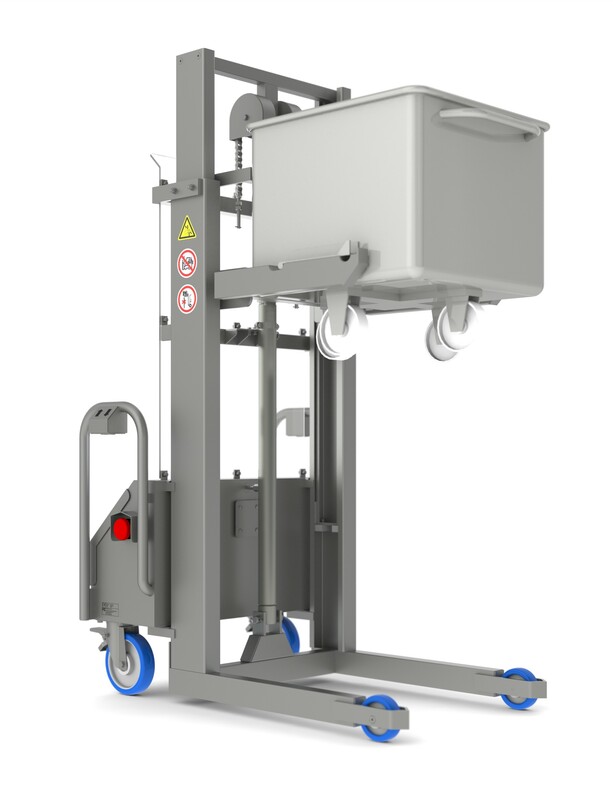 The Backsaver SNT lifting/stacking machine is designed for lifting standard DIN9797 200- or 300-liter meat carts, trolleys or buggies that have to be placed on shelves for storage over extended periods of cooling, pickling, hardening or ripening. 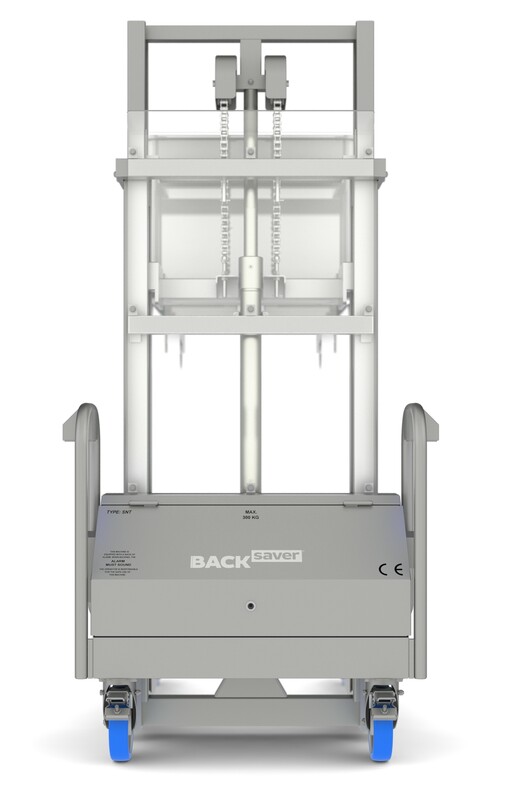 Backsavers are simple, easy-to-use machines that enhance production and reduce the risk of workplace injury. With its maximum lifting height of 1,800 mm, this machine allows for storage at up to 3 tiers of buggies making thus a greater free work floor area available. 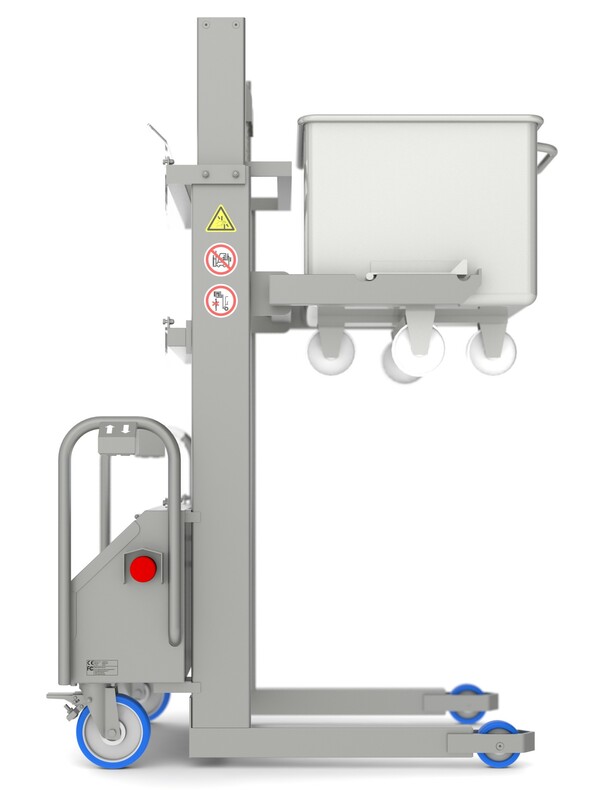 This machine, weighing just 300 kg, can easily be moved around the facility to the location where the products are stored in buggies. 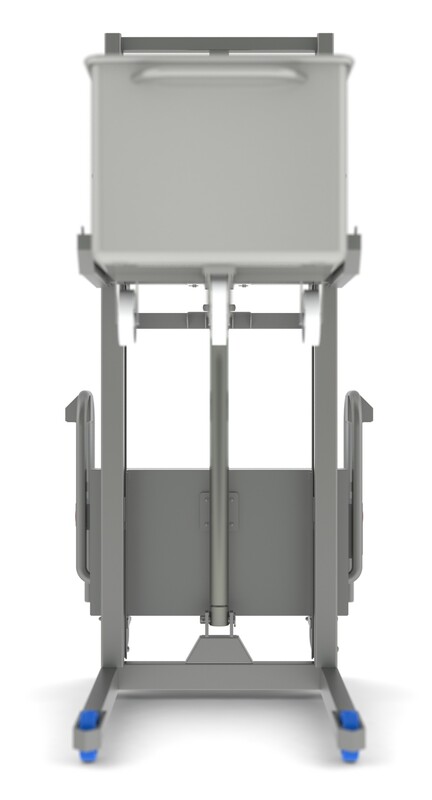 It features a telescoping, upright jack column that makes it remarkably compact and easy to handle. Backsavers are powered by rechargeable batteries, so they can be used everywhere on the work floor regardless of the power-supply location. The battery is suitable for operation in refrigerated areas and can be plugged in overnight for convenient charging. With a fully charged battery you can handle approximately 30 tons of products. Like other Backsavers, this machine is driven by a hydraulic cylinder that uses gravity for the lowering action. So, it’s very safe because it significantly reduces the risk that its moving parts might incur bodily injury. For even greater safety, it features an audible backup signal and a flashing LED beacon light that warn others about parts in motion, ensuring extra attention during operation. 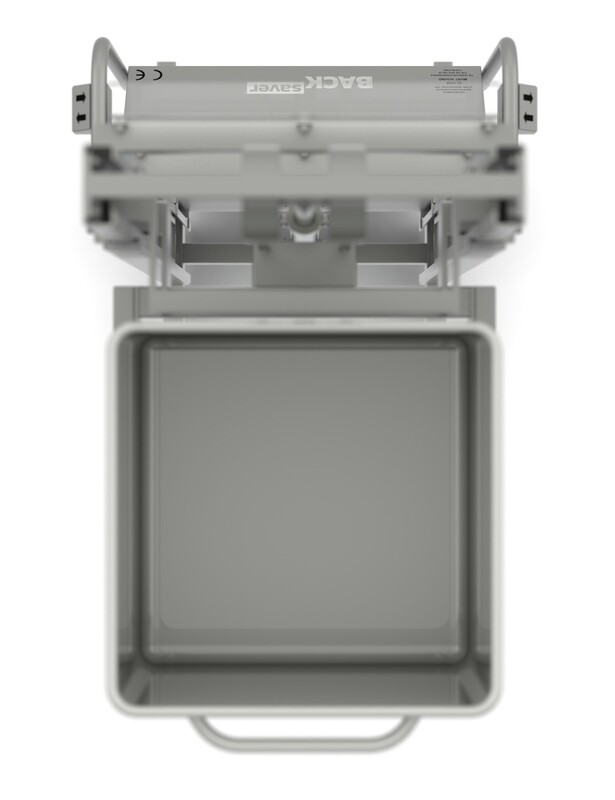 Backsavers are developed especially for the food industry. They are safe to operate and suitable for direct contact with food products. These machines are stainless steel for easier cleanups and wash-downs making it possible to use power washers. SNT has been engineered, designed and manufactured in the Netherlands since 2014. A Backsaver machine can be custom-built to meet nearly any need. Each production facility is different, and every user is different. So, the Backsaver’s adaptability is a plus. Feel free to contact us for more information on customization possibilities or available add-ons and options. *Applicable to the standard machine configuration designed for DIN9797 200- and 300-liter buggies. For other buggy sizes, please, feel free to contact us. Approx. Lifting Height: 1,800 mm / 70.9"